Africa has a population set to double by 2050, and along with population growth, the continent is reaping the benefits of expansion in the country’s information and communications technology (ICT) infrastructure. In Sub-Saharan Africa, there are over 650 million mobile phone subscribers - more than the US or European Union. The subsequent proliferation of mobile and wireless devices is spawning innovations in mobile banking, e-commerce, and health that are unthinkable in the West. Empowered with connectivity and smart phones, Africa's youth are eager and poised to drive the next generation technology advancements and "killer apps". In this session, join some of Africa's top young technologists to discuss the future of technology innovation in Africa. 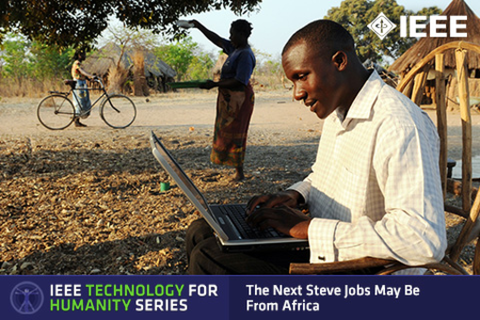 Part of the IEEE Technology for Humanity Series. Graduating from The National University of Rwanda with a Distinction in Computer Science in 2009, Claude’s aim was to use his skills to promote sustainable development. In University, he was involved with youth and community service with Rotaract Club and helped rural communities achieve MDGs with The Rwanda Village Concept Project. Claude has worked in the areas of Data management, mHealth (mobile health) and technologies to promote Maternal and Child health (MDG 4&5) with organizations such as Jhpiego (affiliate to John Hopkins University) and World Relief. He co-founded Noble Click LTD, a local mobile and web-based solutions provider, as well as The iHills, The Rwanda Youth ICT Association. Claude is a founding member of kLab, the first and unique technology innovation hub in Kigali. He is a 2009 ITU Telecom World Fellow, 2011 ITU Global Digital innovator, and a UNESCO Chair fellow in Human Rights. Claude is an active member of the Global Shapers Community for Kigali, which is an offshoot of the World Economic Forum. He is also an active member of the African ICT for Development Researchers Network. Claude is an amateur photographer who live in Kigali, Rwanda. Fred Mweetwa was raised and lives in the rural village of Macha, Zambia, Africa. As the CEO of MachaWorks/LinkNet, he operates a large internet network, which has increased ICT literacy considerably in Zambia. He is co-author of five peer-reviewed articles on rural development. Fred continues his studies at UNISA online and manages his own farm. Highly energetic professional with broad exposure within many contexts, cultures, leadership, and innovation systems. Global experience in infrastructure, Information and Communications Technologies, engineering, social ecosystems, and sustainable progress. Personal strengths include strong analytical and holistic conceptualization skills, linked with results focus and hands on action, sustained through collaboration. Strong developed interpersonal skills and broad networking experience. Lived in urban and rural areas, in Belgium, India, Netherlands, Swaziland, Zambia and Zimbabwe. Jessica Colaço is currently the Director of Partnerships at iHub. She was the Founding Manager between 2010 and 2011 at iHub and the Research Director between 2011 and 2013 at iHub Research. She is passionate about Innovation, Research, Mobile and Robotics Technology and Mentorship and Entrepreneurship in Kenya as she uses her position at iHub to court local, regional and international stakeholders to adopt Kenyan-made solutions.